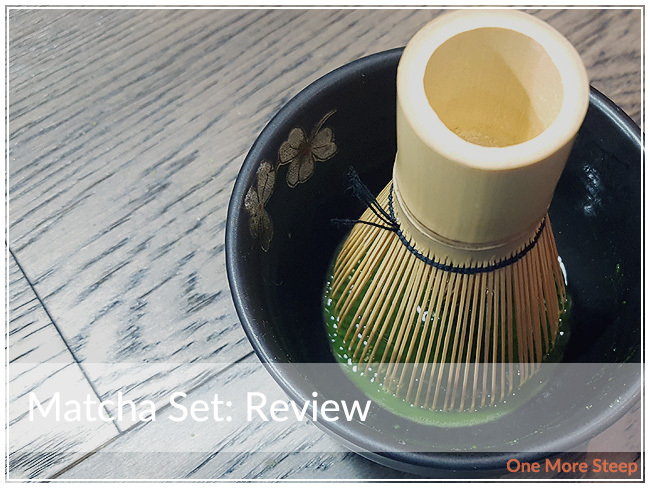 Last year, I was wanting to branch out and start preparing and reviewing matcha at home, which is the primary reason why I purchased this set from Thinktea (a brand available via Stokes Stores). 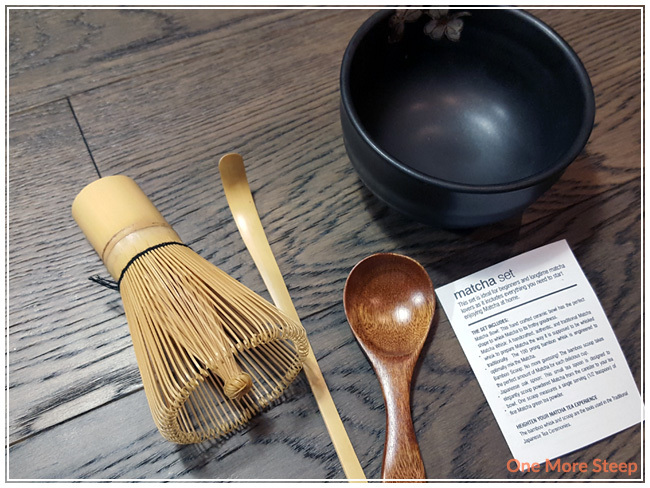 This four piece matcha set consists of a matcha bowl (ceramic), whisk (100 bamboo prongs), a long handled bamboo scoop, and a Japanese oak spoon (where 1 spoon = ½ teaspoon). The one piece that I would say it probably missing is something to sift the powder to break up any clumps prior to whisking. All the pieces seem pretty solid, the bowl has a lovely floral design on the inside and outside of the bowl. I’m not that familiar with what the difference is between the scoop and the spoon, so I’m not sure why both would needed. I gave everything a quick rinse under hot tap water prior to usage, you just never know how long everything’s been sitting in storage for or how many people handled it. I am not a matcha expert, nor do I play one on television. The first time I used this matcha set, I used the scoop to transfer the matcha to the bowl and I wound up spilling some on my counter. I found the oak spoon a lot easier to use (and less spillage! ), so my novice self thinks that the reason why both are included is that one is for novice matcha makers and one is for more experienced tea ceremony masters. I whisked the matcha in an M (or W) motion until it seems well mixed and has some bubbles on top. You do have to whisk quite vigorously to get some foam action happening, so it’s both an exercise in making matcha and a small arm workout. I learned about preparing matcha from Kimmy of Whisk Matcha (when I met her at the 2017 Vancouver Tea Festival) so I’m somewhat confident that I’m doing it somewhat properly. I loved Thinktea’s Matcha Set. I kind of wish it came with some instructions for the very novice beginner, but I think for $29.99, it makes for a great beginner set. 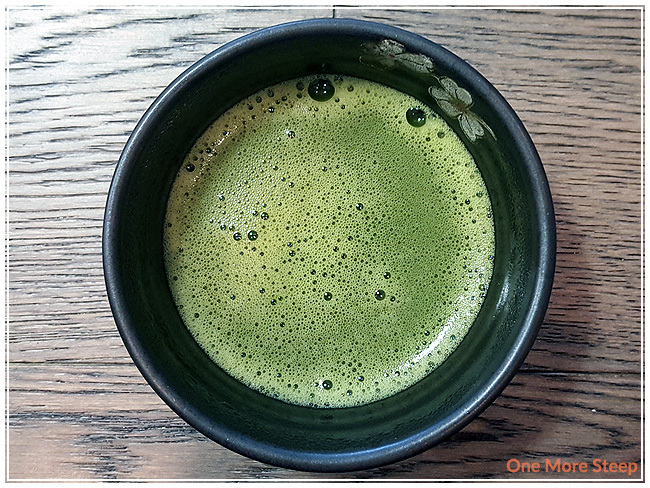 If you’re new to matcha, you don’t necessarily want to be spending a lot of money in your teaware right away because what if you decide that you don’t like matcha or you decide that your preferred way to prepare matcha is in smoothie. For $29.99, you get a bowl, spoon, and scoop that’ll last you for quite a while (possibly forever if you don’t drop or break anything), and a whisk that’ll be decent for whisking up some ceremonial matcha. You could easily spend that much on a fancy matcha bowl alone (or a lot more). 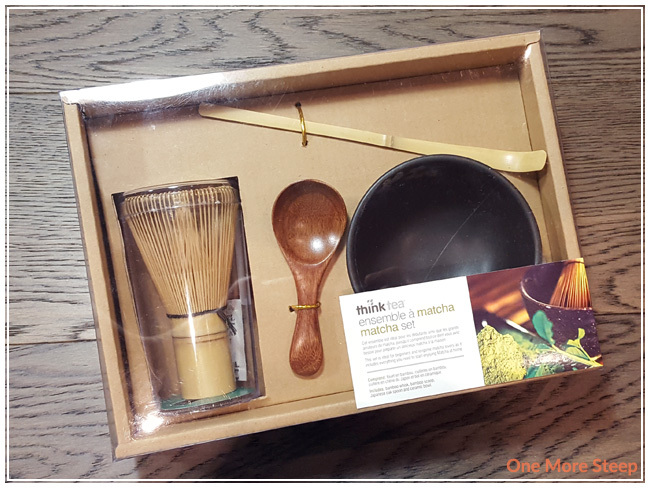 Of the four piece set, the only item that I can see having to be repeatedly replace would be the whisk, since it’s not meant to last forever, which makes this Matcha Set a modest investment in my matcha journey.